Every Student will receive travel insurance with an ID card. Students will need to review their documents and familiarize themselves with their content and regulations. 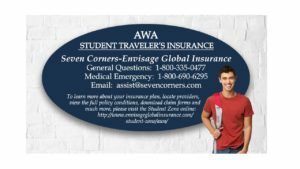 Student traveler’s insurance is for accident and sickness only, no pre-existing conditions are covered! Inside the USA - If Students have sought treatment from an in-network provider, and provided their insurance ID card at the time of treatment, they should be able to bill the Seven Corners claims team directly with no payment up front. If Students have received any medical bills after treatment or paid for any services up front to a provider, they will need to complete a claim form and email these documents to the claims email for processing. Prescription Medications – Any medications that Students have been prescribed, will need to be paid for at the time of purchase and added to any claims they are submitting. For faster processing, AWA recommends scanning and emailing claim forms and other claim documents.